Transylvanian journalist Zoltán Pengő from Kolozsvár/Cluj-Napoca will embark on 7,000-kilometer walk with the main aim to draw the attention of the Romanian community to the life and work of orientalist Sándor Kőrösi Csoma. He plans to leave in September replicating the journey on which the Szekler linguist has set out on 200 years ago. He is looking forward to a very rough journey. The journalist will leave from Nagyenyed/Aiud, where Sándor Kőrösi Csoma studied in the college and the final destination is Zangla in India, West Tibet, where the linguist did his research. 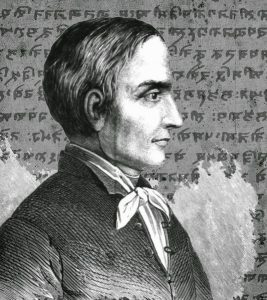 Sándor Csoma Kőrösi born Sándor Csoma (27 March 1784 – 11 April 1842) was a Hungarian philologist and orientalist, author of the first Tibetan-English dictionary and grammar book. He was born in Kőrös, Grand Principality of Transylvania (today part of the town of Kovászna/Covasna). Hoping to find the ancestral land of the Szeklers and the Hungarians by studying language kinship, he set off to Asia in 1820 and spent his lifetime studying the Tibetan language and Buddhist philosophy. Sándor Csoma Kőrösi is considered the founder of Tibetology. He was said to have been able to read in seventeen languages. He died in Darjeeling while attempting to make a trip to Lhasa in 1842 and a memorial was erected in his honor by the Asiatic Society of Bengal. “This November will be the 200 years anniversary of the starting of Kőrösi’s journey. I pay my tribute to his memory by going on this journey mainly by foot, alone. According to the plans I will depart on the 2nd of September because I would like to avoid the hot weather in India and Pakistan.” Pengő said. The journalist says that he would very much like to get the Romanian community acquainted with the life and work of Kőrösi Csoma because “we live in parallel societies, we, Hungarians know details of the Romanian culture, because we’ve learnt it in the school, but they know very few things about us”, he said. According to the plans of the journalist with an entrepreneurial spirit, the journey will last 9 months. He will travel mainly by foot except for the regions that may be to dangerous for a lonely traveler: for example Afghanistan, where he will take public transport. “I was fascinated by the legacy of Sándor Kőrösi Csoma since I was a kid. The thought that it would be nice to start on a journey to pay tribute to him first came to me 20 years ago but back then I did not have the courage to do it. Now, at the 200 years anniversary I thought it would be appropriate”, Pengő said. He also plans will hold press conferences about his trip in Gyulafehérvár/Alba-Iulia, Pitesti, Bukarest/Bucuresti and Giurgiu. “I will carry two flags on my backpack: a Romanian and a Szekler one. The Romanian, because I am a Romanian citizen and the Szekler one because of Csoma, he was a Szekler. This way I will pay a tribute with maximum respect to everyone”, Pengő said.